TurtleSkin WaterArmor uses an innovative, patented fabric to provide protection from high-pressure water jet injuries. Created by Warwick Mills, TurtleSkin is made from the tightest weave ever achieved in aramid, a fiber two times stronger and five times lighter than steel. TurtleSkin WaterArmor can protect ultra high-pressure water jet operators from pressures as high as 2800 bar (40,000 psi). We certify all TurtleSkin high-pressure water jet protective products to meet specific performance standards. 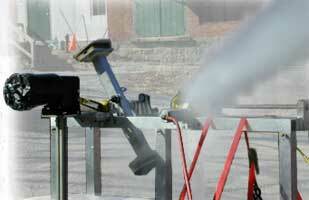 We ensure that the quality and calibration levels of all of our high-pressure water jet safety equipment. Warwick Mills is ISO-9001:2008 Certified. The protective performance of TurtleSkin WaterArmor depends on multiple factors, such as pressure, water flow, nozzle diameter and construction, distance between the high-pressure water jet and protective equipment, and contact time (swipe speed of the water jet). Under extreme circumstances (high pressure, high flow, close distance, and low speed) WaterArmor may not provide full protection. Please review the chart below. Water jet testing information is based on technical data Warwick believes to be reliable and is subject to revision as additional knowledge and experience is acquired. Warwick makes no guarantee of results and assumes no obligation or liability in connection with this garment. Failure to read and understand this information could result in severe injury or death.